The blade is Jyo Jyo saku ranking. Shape(Sugata):The blade is wide and thick with deep sori and long kissaki nice healthy looking shape. Blade length(nagasa) : 51.0 cm or 20.07 inches. Width at the hamachi : 3.04 cm or 1.19 inches. 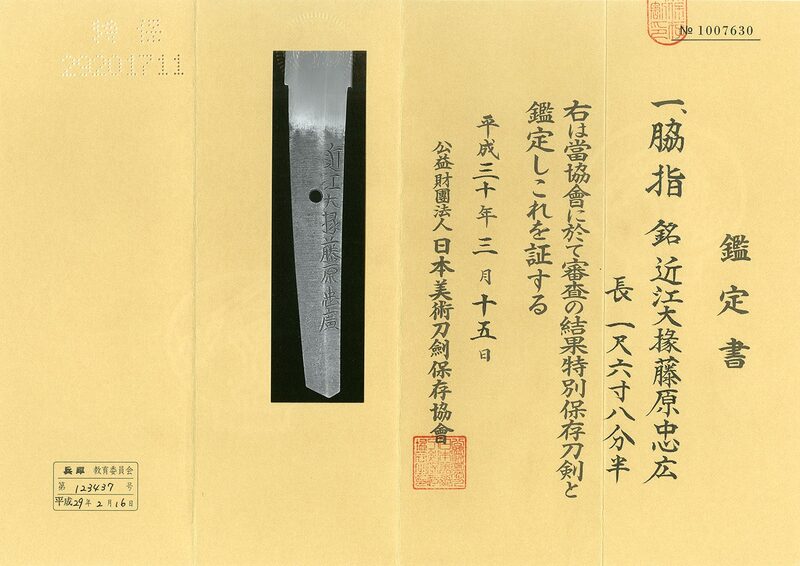 Width at the Kissaki : 1.2 cm or 0.47 inches. Kasane : 0.59 cm or 0.23 inches. Jidai : Edo period Kanei era.1624. which is middle suguha hamon. but he was enough skillful to forge sword at that time. aged 80. He is known as a skillful swordsmith almost all works are above the standard hizen-to. swords among the swordsmiths of Hizen school. He was good at both of Suguha-hamon and Choji-midare Hamon. Tsuba :On the round syakudo tsuba, waves and a dragon are engraved with gold color. difference is Hizen blade doesn't appear Utsuri and hizen blade hamon more thick nioikuchi. This wakizashi is very nice middle suguha hamon with thick nioikuchi. Boshi is thick nioikuchi round shape.